Pro-Stage stage kits are available in an Industrial surface finish and feature our unique telescoping height adjustable legs which are available in several height adjustable options. Our unique legs also allow our staging to be set-up on un-even terrain. All staging has an International TUV rating at 500kg/m2. This stage is factory rated to hold up to 153 lbs per sq. foot (750 KGS/sq. Meter). Please note, these kits only include 4'x8' stage panels and matching legs. Stairs, guardrails, skirts or transportation/storage units must be purchased separately. All stages lower then 32" are available in a version with or with our leg adaptors. 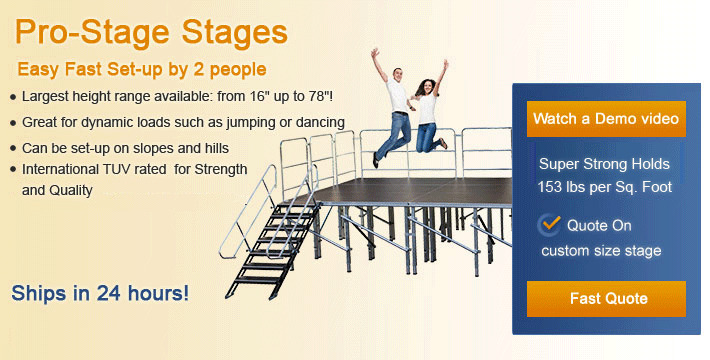 The version with leg adaptors saves costs as it allows multiple stage panels to share the same stage legs. In the version without the adaptor each stage panel has 4 legs and legs are not shared in-between panels. All stage kits higher than 32" require the use of stage leg braces. These leg braces are included in the kits. Please shop our stock Kit sizes below. If you need a quote on a custom size please use our Fast Quote or call one of our friendly sales team members at 877-884-3426.